Whether your home came with a pool when you first bought it, or you have purchased and installed one yourself, keeping up on the maintenance of your pool is no easy task. Even with the most adamant maintenance practices, pools can still lose their initial shine and brilliance after a season or two of use. So how do you get your pool back to looking like it did when you first installed it? Fortunately the professionals at Sundays Off Pools can help restore your pool back to its initial shine and make it look as new as the day you bought it. We are skilled in both pool remodeling and rebuilding, and will work with you to get you the pool you have always dreamed of. Why Remodel Your Swimming Pool? Your pool, just like your house, is constantly exposed to outdoor elements like rain, wind, and wide ranges in temperature variation, from the scorching sun in the summer, to the freezing cold in the winter. 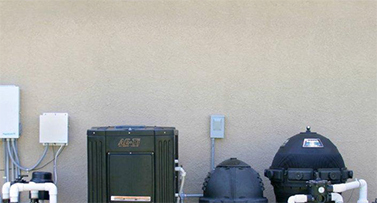 Overtime, these elements come to have a big impact on the life and functionality of your pool. Remodeling your pool will not only restore its aesthetic quality, but it will also ensure your pool runs efficiently and lasts longer. Survey. The first thing we do is conduct an entire survey of your pool and pool maintenance system, including the equipment and deck. We also consider other factors like your yard’s landscape and layout to determine the best options for structural support and drainage. This allows us to formulate a plan that is specifically tailored to your yard, needs, and expectations. Remodel. Once we have a plan laid out for approaching your unique situation, it’s time to start rebuilding. 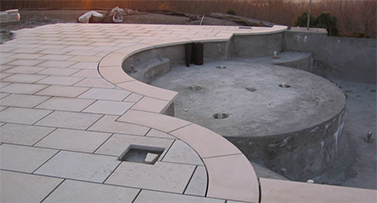 Our services include new tile, coping, resurfacing, and also renovations to your surrounding deck, so you can be sure your pool is equipped with the latest technology and durable building materials. Outdoor Pool Remodeling. As we said, we don’t only look to renovate your pool and bring it up to standards, but your surrounding deck as well. The professionals at Sundays Off Pools can design an entirely new outdoor living space for your pool, transforming that old, dull wood deck into a relaxing, private oasis hidden right in your backyard. We’ll handle any landscaping, drainage, and lighting issues that need to be addressed in order to get you an outdoor living space you never imagined you could have. With spring already upon us, and summer following shortly after, there is no better time to get your pool ready for summertime parties and events. Contact the professionals at Sundays Off Pools for more information about our Minneapolis, MN remodeling and rebuilding services, and get the pool you have always wanted for your family today.